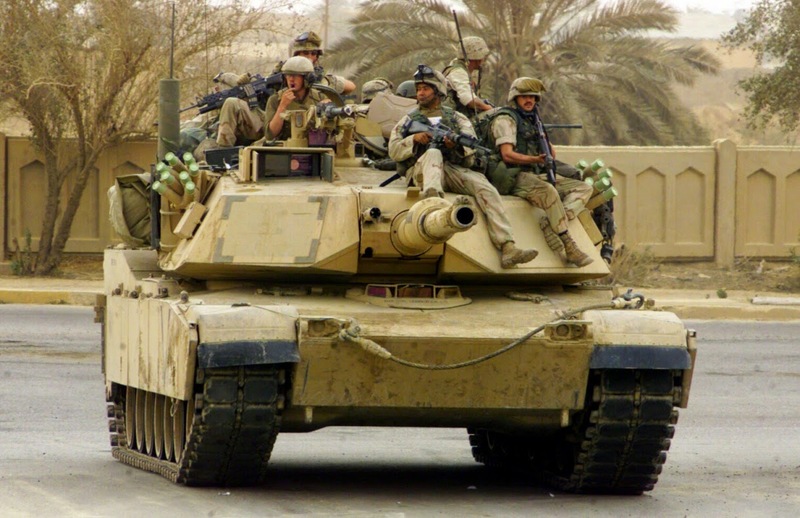 I think M1 Abrams and M2 Bradleys arriving for service in Desert Shield in three-tone NATO camouflage. Some or most were repainted in desert tan after arriving. My Desert Storm M1A1 I'm building will not have much weathering but I'm wondering about the underside of the tank. What color would it be? Were the backside of the wheels and road arms repainted tan or left in the original colors. A while back I wrote about painting what you see. This is a perfect example of how you can apply that principle to your models. Look at this photograph of an M1A1. What color is the underside, assuming you were low enough to see it at this distance? The underside looks black to me, because it's in heavy shadow. It might be sand, black, or pink. I don't know, and for my purposes in building a model, I wouldn't care. Painting the underside black, dark grey, or dark green would offer the viewer a reasonable representation of the tank in scale. That, my friends, is painting what you see. It's a simple approach to scale modeling that diminishes the sometimes overwhelming burden of research and documentation and lets us build models the way our minds see aircraft, vehicles, and ships in the real world. I enjoy research as much as the next guy, but sometimes I just want to move a project forward without a quest for the facts slowing me down. I would be remiss in adding a note about this person's specific question. I don't know the answer, but absent any definitive proof we have to rely on logic and intuition to surmise what probably happened back in 2006. If I were responsible for tasking my soldiers to paint the tanks in my battallion, I wouldn't expect them to crawl under every vehicle to paint their underside and back of the wheels. That effort would seem to me to be a waste of time and paint and ultimately add little or no value to our efforts to camouflage the vehicles. Does research -- even if you enjoy it -- slow you down?